This portal is not manually maintained. However, please contact Paulmcdonald when you plan to make significant changes. The 2000 Sugar Bowl was the designated Bowl Championship Series (BCS) National Championship Game for the 1999 college football season and was played on January 4, 2000, at the Louisiana Superdome in New Orleans. The Florida State Seminoles, representing the Atlantic Coast Conference, defeated the Virginia Tech Hokies, representing the Big East Conference, by a score of 46–29. With the win, Florida State clinched the 1999 Division I college football championship, the team's second national championship in its history. An estimated total of 79,280 people attended the game in person, while approximately 18.4 million US viewers watched the game on ABC television. The resulting 17.5 television rating was the third-largest ever recorded for a BCS college football game. Tickets were in high demand for the game, and tens of thousands of fans from both teams attended the game, many using scalped tickets to gain entry. The game kicked off at 8 p.m. EST, and Virginia Tech received the ball to begin the game. Though Tech advanced down the field, Florida State scored first and took advantage of a blocked punt for a touchdown, giving the Seminoles a 14–0 lead in the first quarter. Tech answered with a touchdown drive of its own before the end of the quarter, but Florida State scored two quick touchdowns to begin the second quarter. Virginia Tech scored a touchdown before halftime, but halfway through the game, Florida State held a 28–14 lead. In the third quarter, Virginia Tech's offense gave the Hokies a lead with a field goal and two touchdowns. Tech failed to convert two two-point conversions, but held a 29–28 lead at the end of the third quarter. Florida State answered in the fourth quarter, however, taking a 36–29 lead with a touchdown and successful two-point conversion early in the quarter. From this point, the Seminoles did not relinquish the lead, extending it to 46–29 with another touchdown and a field goal. ... that the Harvard Crimson football team (home stadium pictured) has won 12 national championships and is the eighth winningest team in NCAA Division I football history? ... that American football running back Keith Elias graduated from Princeton University with 21 Princeton Tigers records and 4 National Collegiate Athletic Association I-AA records? ... that Vanderbilt's "Blonde Bear" supervised the ransacking of black households in the 1946 Columbia Race Riot? ... that Native American football player Peter Hauser has been credited with throwing the first spiral pass? ... that the Yale Bulldogs football team (mascot pictured) has won 27 national championships and ranks second in wins in college football history? ... that Michigan's All-American 60-minute man Tom Johnson was the second African-American player for the Green Bay Packers? ... that Deputy National Security Advisor Denis McDonough played for Hall of Fame football coach John Gagliardi at Saint John's University? ... that the Wittenberg Tigers from Springfield, Ohio, have won more games than any other Division III college football team? 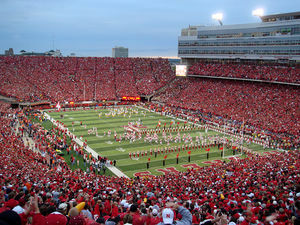 Memorial Stadium in Lincoln, Nebraska, home of the Nebraska Cornhuskers football team.